The difference between the rows of late model cars at the junkyard awaiting the crusher and Grandpa's 400-thousand mile 1974 Mercury Bobcat Wagon with genuine simulated wood grain paneling is regularly scheduled maintenance. The failure of an inexpensive and easy to replace part can cause a heap of pricey damage. This is especially true of the automotive cooling system thermostat. The thermostat lives in between the engine and the radiator and acts as a temperature controlled engine coolant valve. If this valve fails and slams shut, so does the cooling system. An overheated engine and driver are often the unfortunate end result. The good news is thermostats are inexpensive and fairly simple to replace. Symptoms of a failed thermostat are an engine that takes forever to warm up, or an engine that's running hot despite every other part of the cooling system being in good shape. The primary function of the thermostat is to allow the engine to warm up quickly by restricting coolant flow to the radiator during the first few minutes after the engine is kicked over. Getting the engine to operating temperature quickly helps it run more efficiently. Sensors peering into engine coolant tell the computer how much fuel to add and at what idle speed to run the engine on cold start. Fuel is added in greater quantities and RPM is kicked up a few to prevent cold stalling. These same sensors tell the computer to give the rich condition a rest once the engine is warm. In colder climates getting the engine warm fast also means warm drivers and passengers, as heater operates by way of toasty warm engine coolant. The secondary function of the thermostat is regulating coolant flow to maintain steady engine operating temperature and cooling system efficiency. Each thermostat has a temperature at which it will fully open. Engines are designed to run most efficiently at a certain temperature and for this reason it's important to always replace a thermostat with another of the correct temperature rating. Installing a 160-degree thermostat into an engine designed to operate at 195 degrees can cause poor fuel economy, as the computer will meter an incorrect amount of fuel. An engine running too cool can fool the engine computer into running the engine too rich. When a thermostat fails outright one of two things happen. The better thing is when the thermostat gets stuck open. The worst thing is when the thermostat gets stuck closed, and corks up hot coolant in the engine. Coolant trapped inside a running engine quickly overheats. A mess of problems can arise from an overheated engine - none of them good news. Engine overheating is the number one cause of cylinder head cracking and failure. Melted and cracked aluminum engine components such as cylinder heads are much more expensive to replace than a thermostat. As draining the coolant or removing the radiator hoses are the first steps in replacing a thermostat this is a good time to check and replace the thermostat. Thermostats almost always reside in a housing at the engine side end of the upper radiator hose. Drain coolant into a catch container. 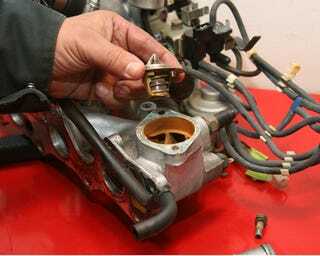 Loosen and remove radiator hose to access thermostat housing. Consult the service manual if the housing cannot be found. Loosen the bolts that hold down the thermostat housing. Remove the housing to reveal thermostat. Note the orientation of thermostat relative to the engine. Draw a picture of this orientation in a Big Chief writing tablet, or take a picture with a digital camera. Remove thermostat. That small valve in the thermostat body allows trapped air to pass, and needs to be on one side or the other. Testing a thermostat is easy. Put the thermostat in a saucepan full of cold water. Turn on the heat. Watch the thermostat, and at what temperature it opens. This temperature is usually on the bottom of the thermostat itself. If the thermostat does not open the problem has been found! Use a scraper to remove old gasket material from all mounting surfaces. All of it. Place new gasket on housing. Use a small amount of grease or adhesive to hold it in place during reassembly. In a perfect world the gasket will stay on the housing next time around. Install new thermostat. Spring side down. Make sure new thermostat is oriented properly and reinstall the housing. Do not over tighten the bolts on the thermostat housing. The housings are fragile and can easily crack. This housing came apart thanks to ham-fisted wrenching. Close radiator petcock. Reconnect all hoses. Either return original coolant to the cooling system or refill the radiator a 50-50 mix of new coolant and distilled water. Minerals in tap water can contribute to cooling system corrosion buildup. Fill radiator 3/4 or so full. Start engine. Slowly top off radiator with engine running to burp any trapped air from the cooling system. Replace radiator cap. Check overflow tank level.